A deceased war veteran�s estate and his long-lost daughter set the scene for murder and deceit. Perry must set the facts straight and help the daughter, Doris Hocksley, regain her identity and fortune. In the opening scene, John Lowell deftly tears an ad from a newspaper and hands it to Doris Hocksley. As she looks at it, we see there�s no printing on the back. How odd! See here. Submitted by Eli Kaminsky, 10/3/2005. Small world: Miriam Hocksley (played by Mary Shipp) says �My father�s name was Adam Hocksley. He had a biblical turn of mind. He called me Miriam.� Olive Deering, who plays Rebecca Gentrie, also had a blibical turn of mind. She played Miriam in the biblical epics The Fifteen Commandments and Sampson and Delilah. Submitted by Charles Richmond, 12/23/2005. + "According to the Hebrew bible, Miriam was the older sister of Moses and Aaron. She was also a prophetess in her own right...Miriam first appears in the biblical book of Exodus...[she] also appears in the biblical book of Numbers," judaism.about.com observes. Mike Bedard, posted 4.23.15 Before MeTV's airing of TCOT ET. ++ Teleplay writer Seeleg Lester had a "Biblical turn of mind": "Judas" of New Testament infamy is mentioned & "Rebecca" was "the wife of Isaac, mother of Esau and Jacob. Gen. 24-27 [Webster's Unab. Dict.]." Mike Bedard, posted After watching ET with Lapcat Tigger/sister Winnie by my side. Elston Carr�s house number is 3972 as seen twice on the curb outside his home. Submitted by PaulDrake 33, 1 December 2009. Another episode that contains multiple murders. Submitted by PaulDrake 33, 1 December 2009. + Indeed, at least two and maybe three, depending on the accuracy of Tragg's prognosis... or lets just say it has two-point-six. Added by Notcom, 081216. Uncredited Actors: Don Anderson is a courtroom spectator in the last row on Burger�s side of the aisle near the door. Submitted by FredK, 7 October 2010. + We have two uncredited actors playing plainclothesmen. (See Credits, above). Submitted by gracenote, 8/31/2011. Sightings: It�s easy to miss, but an un-hatted plainclothesman dusting for fingerprints behind Tragg is none other than Pencil Mustache Man. Later, the Man and several other cohorts�Distinguished Lady #2, Little Old Lady #2, and Little Old Lady #1�appear in the courtroom gallery. Distinguished Gentleman #1 is the court reporter, again. Submitted by gracenote, 8/31/2011. +The Distinguished Lady #4 sits on Perry's side of the courtroom. Submitted by BigBill767, Nov 11, 2016. Syndication cuts: In the hospital, Mason telling Doris that he'll get answers from John Lowell and his trip to San Francisco along with the truth about Gow Loong and John Lowell; the argument between Mason and Burger over the word pretender. Additional Hallmark cuts: [In the original/syndicated versions the Alan/Doris conversation begins with a long shot with Alan saying "That's quite a history" and asking what her father looked like. Then a closer shot of Doris and Alan with Doris saying she doesn't remember and only had an impression of him. This dialogue was cut from the Hallmark version and the next line, her saying that she was only a child the last time she saw him, was dubbed over the long shot with the rest of the conversation following]; Carr saying his nephew Alan is helping to find Adam's daughter, needing Mason to do the job right and telling him to look at the check; Perry asking Miss Gentrie on the phone if Carr was shot, her saying she saw him on the floor, someone else is in the room, she think's he dead and what should she do? ; Tragg asking Miss Gentrie if she left Carr alone and Rebecca saying yes, returning and seeing the light in the room which wasn't unusual because he often works late; part of Paul and Perry's conversation concerning where the action was; [In the original/syndicated versions Mason asks Doris in the hospital if the photo had rounded corners, she responds she doesn't remember and asks how Lowell could have brought her a photo she threw away and Mason saying he could have duplicated it, Mason sighs, then gets up and makes a comment about Burger prosecuting. In the Hallmark version after Doris says she doesn't remember about rounded corners, the scene cuts to Mason sighing with a piece of music dubbed over it to indicate the end of an act and the scene ends. ]; Burger asking Dr. Morton on the stand about the distance the fatal shots were fired and the response, 6 to 9 feet; Burger asking Miss Gentrie if Doris was in the courtroom and her response, next to Mason; Mason asking Tragg about the significance of the photo not fitting in the tin and the response, none; during Miriam's testimony, Mason objecting about hearsay evidence, Burger's response, the judge permitting the question and Burger asking Miriam if he should repeat the question and the response, no; Burger's objecting over Mason's asking Miriam where she was on the night of the murder, Mason's response and the judge allowing it; part of Mason trying to break apart the empty tin, smashing it against his knee and Burger exclaiming that it's state's evidence; [In the original/syndicated versions Mason tells Miss Gentrie "a bride and groom practically on their honeymoon, the bride shoots the bridegroom" all on a close-up of Mason. In the Hallmark version the first line is cut and the beginning of the second "the bride shoots the" is dubbed over the footage of Mason saying "a bride and groom"]. Submitted by Wiseguy70005, 7/21/12. Closed-captioning oddities: When Tragg asks Doris a question and she doesn't respond, Mason says in explanation "Shock, Tragg." In the aired versions, the closed-captioning reads "She's out, Tragg." Also, during Miriam's testimony she states "[Mason] told me that [Doris] knew where the key evidence was." Burger asks "Was that in the safe in Elston Carr's library?" Mason objects, the judge permits the question and Burger asks if he should repeat the question and Miriam responds, "No. He told me that she knew the evidence was in the safe." Hallmark cut the objection, the judge and the offer to repeat the question and the response, no. However, the word "no," which appears on the same line as the rest of the response in the closed-captioning, stayed in. Someone just reading the captions of the Hallmark version would see Burger asking a question and the witness saying no, then answering the question in the affirmative. Submitted by Wiseguy70005, 7/21/12. Sponsored Items: I watched this episode on MeTV and once again I saw the same FOUR sponsored items pictured at the end in episode 7, 21, and 23 show up here. Once again, I WAS ABLE to see that the FIRST one was actually "Sweetheart Soap", as helpfully provided by Wiseguy70005 on 4/14/15 for episode #7. The picture and lettering were VERY clear again. ;-> The Second was "New Blue Dutch Cleanser". The Third was "trend" (with a lower case, "T"). The Fourth was "Beads-O'-Bleach". Submitted by mesave31, 04/23/15. The photo of the three men in China is an obvious composite. The men have been "photoshopped" onto the street scene. Submitted by Kilo 5/27/2017. + Ha Ha. I just realized Perry actually uses the words "photo shop" in the episode! Kilo 12/16/2018. Erle Stanley Gardner published his novel The Case of The Empty Tin in 1941. This episode has the same name, but little else in common with that novel. In the novel, Perry never enters the courtroom. Submitted by PaulDrake 33, 27 May 2009. In Erle Stanley Gardner�s 1941 novel, The Case of the Empty Tin, the character of Arthur Tragg makes his first appearance. Submitted by PaulDrake 33, 27 May 2009. 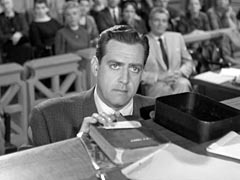 Frank Wilcox plays the judge in this episode, his fifth of seven appearances as a judge in the prolific first season of the series. He gets to show a bit more of a human side than most actors did in that role. First, he shows considerable amusement at Mason and Burger�s wrangling over the meaning of the word �pretender.� Later Wilcox delivers what is (in my opinion) the best line given to a judge in 271 episodes. As Mason starts to dismantle the empty tin, Burger begins to splutter in protest. Wilcox says: �If Mr. Mason's going to crawl out on a limb, the least we can do is let him saw it off.� Submitted by FredK 17, Oct 2010. Hallmark Movie Channel starts the week with this episode, #25, following Sunday's marathon of episodes 1-24. But FIOS has continued to list show info sequentially from last Friday's episode #217, and yesterday's two dozen marathon episodes, which were also mislabeled. FIOS thinks today's first show is #242. Submitted by MikeM, 10/9/2012. (Small World 2 continued): In a strange twist, Olive Dearing gets to play Miriam once again when, in this episode, she calls Perry pretending to be Miriam Hocksley about to commit suicide. Submitted by Charles Richmond, 10/11/2007. +In her call to Perry, Della stated that Rebecca called "the service" (answering service, I presume) asking for Perry's private number; the service called Della and Della called Perry for authorization. jfh 12May2017. A glimpse of the elegant Ms Street in her elegant boudouir wearing her elegant dressing gown.